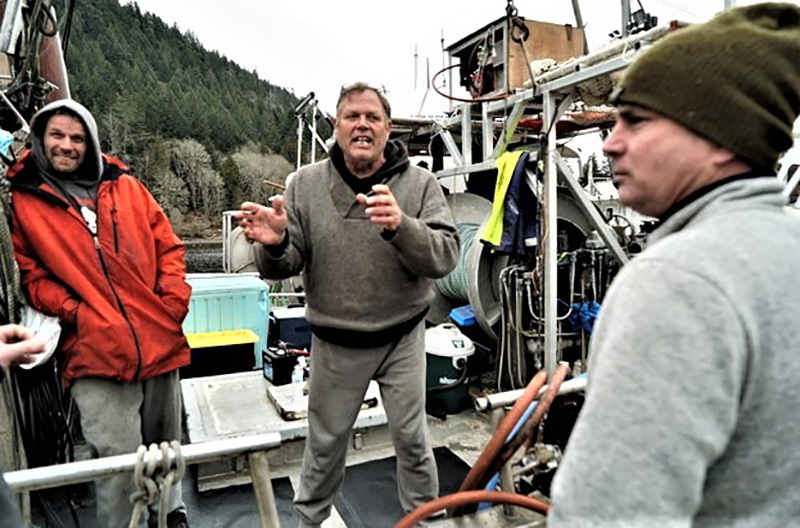 ‘You are telling me what I’ve been doing my whole life is wrong.’ Docked at Hornby Island, boat captain Calvin Siider faced off with conservationists, including Ian McAllister (at right), urging closure of BC’s herring fishery. Photo: Ian Gill. When the herring finally disappear, we’ll have only ourselves to blame. Indeed, it sometimes seems blame is about the only renewable resource we can rely upon anymore. There’s certainly been an abundance of it this herring season in the Strait of Georgia, here in the northern reaches of what’s fast becoming the Salish Sewer. At the dock of Hornby Island’s Ford Cove, a world-weary gillnet fisherman, Calvin Siider, squared off against a conservation group advocating for the closure of the last commercial gillnet fishery on the B.C. coast. Siider, while waiting for the signal to go fishing, was variously sitting, pacing, standing and gesticulating from the deck of his boat, Maile III, out of Sointula. A few feet away, just out of throttling distance, stood Ian McAllister, executive director of Pacific Wild.